This week I will be mostly making a big fuss and talking even more than I normally do about living with multiple allergies to help spread awareness because it’s Allergy Awareness Week from Monday 28th April to Sunday 4th May and this year the Food Standards Agency is making a Thunderclap of a fuss about allergy awarness along with Allergy UK and The Anaphylaxis Campaign. It seems the weather is out there joining forces to produce some real thunderclaps to give extra weight to the cause so please help to make reall buzz this week. Spread the word, flood social media with a deluge of tweets and posts about living with allergies. We need lightening bolts to shed light on what it’s really like living with life threatening allergies. We need compassion, awareness and understanding. That is all we ask for. No special treatment, just not to feel like a freak, a fussy eater and a problem wherever we go. We just want to be normal. If you know anyone with allergies, do you know how to adminster their adrenalin autoinjector? Why not ask them what it’s like for them. Ask them to show you how to use their injector if they have a trainer pen. Ideally we should practise regularly, every month so we know how to give this life saving treatment. As Maureen Jenkins of Allergy UK said yesterday at their Annual Conference, “If you were cooking slap up meal for a dinner party of well loved guests you would practise, you would prepare well before hand, you would make sure it turned out really well. It should be the same with preparing for our own and our child’s safety. Using adrenalin autoinjectors is really easy if you’ve been show how so one thing we should all do is make sure those close to us who spend most time with us or our children know how use one.” The school, your work colleagues, your friends, your gym buddy etc. Get a trainer pen from your injector provider (they’re free) and demonstrate it. Use expired pens into an orange, it could save a life so make sure you and your loved ones know how to make that happen. Spread the word people, also about cross contamination and precautions you take to keep safe from checking labels to keeping work surfaces clean and making sure no allergens are present and if any are in the house, they are properly and safely stored. To find out more about how you can get involved in Allergy Awareness Week visit Thunderclap Now! 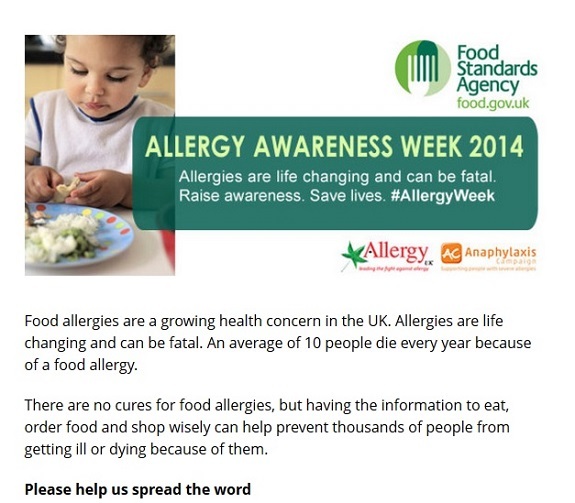 Use the hashtag #AllergyWeek and follow the campaign on Facebook and Twitter.